The difficulties presented by the under-resourced Gardaí in policing domestic violence, and the resulting lamentable status of domestic violence policies in Ireland were highlighted by last week's tragedy. Last week, the state funeral of Garda Tony Golden took place in Omeath, Co. Louth, Ireland. He was shot dead the previous Sunday evening whilst responding to a domestic violence incident. On Sunday afternoon, Garda Golden had taken a statement from Siobhan Phillips regarding a complaint of alleged domestic abuse by her partner Adrian Crevin Macken. Afterwards, Garda Golden accompanied Phillips and her father to her family home. Garda Golden and Phillips entered the house in order to collect some of her personal belongings, whilst her father waited outside. Shortly after hearing gunshots from the house, Phillips’ father immediately contacted the Gardaí by way of 999. Adrian Crevin Macken had shot Garda Golden and Phillips, before turning the gun on himself. Garda Golden died at the scene. Phillips, who received multiple gun shots to her head and body, remains in a critical condition in Beaumont Hospital in Dublin. Garda Golden’s death highlights the dangerous working conditions of the Gardaí in times of austerity: under-staffed and under-resourced. Serious questions need to be asked about the circumstances of this incident. Why was Garda Golden alone, without backup, whilst accompanying Phillips and her father? Did he know about Macken’s prior criminal history? Was this a singular incident, or had Phillips previously reported an ongoing problem of domestic violence to the Gardaí? The inadequacy of Garda resources to deal with violent crimes has reinserted itself into political discourse, in the wake of Garda Golden’s death. Minister for Justice Frances Fitzgerald stated how the Government is responding to the rising crime rates. 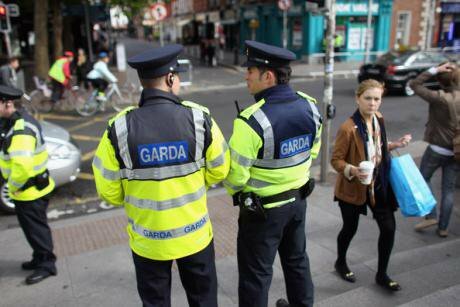 Acknowledging that the force had been ‘starved’ during the economic crisis, the Minister pledged with the new Budget to address rises in violent crime by making the Gardaí more visible through recruitment; 550 Gardaí this year, and 600 to follow in 2016. Whilst there has been a considerable focus in the media on rises of certain forms of violent crime (like burglaries or rural crimes), there has been minimal focus given to the issue of domestic violence. Garda Golden’s death serves as a stark reminder, twofold: first, of the dangers faced by an under resourced police force in times of austerity, and secondly, of the prevalence of the often fatal nature of domestic violence in Ireland. Dangerous individuals, or dangerous policy? The violence of Macken should not be categorised as an isolated event. Macken’s act should instead be seen to reflect a continuum of instances of domestic violence in Ireland. 55% of women murdered in Ireland were killed by partners or ex-partners, and 62% were killed in their own homes. The Garda Síochána Crime Investigation Report (2014) issued by the Garda Inspectorate last year problematized the strategic management of domestic violence disputes in Ireland, in policy and in practice. It was highly critical of the lack of a national auditing of domestic violence policy, the lack of follow up visits to domestic violence disputes, and the scarcity of resources offered to domestic violence victims. The Report ultimately recommended that the Gardaí ought immediately implement victim-centered domestic violence policies and establish specialised domestic violence investigative practices. Key actions that needed to be taken included: a national monitoring system for domestic violence cases, the establishment of specialised investigative teams, research to be conducted on domestic violence related murders to inform harm reduction strategies, and the implementation of risk assessment processes to be completed at all domestic violence incidents. This tragedy raises broader questions as to the ability of an under-resourced Garda force to deal with domestic violence. It brings domestic violence policy, and how individual Gardaí must respond to domestic violence cases, under scrutiny. Has a national audit of domestic violence policy been undertaken, as recommended in the Garda Inspectorate Report? Are the Gardaí adequately resourced and staffed to establish teams specialised in handling domestic violence cases? Are risk assessments taking place in Garda stations, when notified of domestic violence disputes? How are domestic violence cases being tracked or monitored? Are follow-up visits to victims taking place? Will new recruits be trained in how to best to deal with the particular difficulties presented by domestic violence disputes? The political discourse surrounding Garda Golden’s death has rightly addressed the dangerous working conditions faced by a Garda force, starved of adequate funding or resources. However, by clouding the continuum of fatal domestic violence disputes in Ireland, media discussion of the case neglects an important issue: the dangerous (lack of) policy on domestic violence in Ireland. There were two victims in this case, Garda Golden and Siobhan Phillips, who remains in a critical condition in hospital. Attention ought to be drawn to the lasting damage cut-backs have had on the Gardaí- but in particular, the difficulties presented by policing domestic violence in times of austerity, and the resulting lamentable status of our domestic violence policies.